Having reviewed this Lewis work with many of his others already, I can’t help but recommend that you listen to this classic on cassette. This is the kind of book where concentration is difficult and reading this kind of writing is already slow. I took this along on a long trip so I could listen without interruptions and the message of the book became clearer than ever. This is not Lewis’ voice (The Four Loves on cassette is the only one like that) but York’s British accent makes you quickly forget. Interesting to me was the publisher’s introduction. Lewis was asked (by the BBC) to give these talks on radio during the war years between 1941 and 1944. 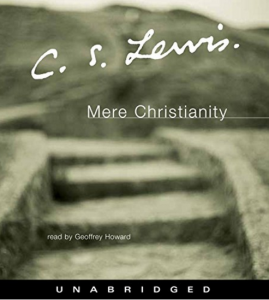 Mere Christianity was the result. They were, therefore, originally intended for listening rather than reading. But more interesting than that is the content (Christian Apologetics!) which he chose. He was speaking to a country under constant attack from Hitler’s Germany. I couldn’t help but wonder what today’s Christian leaders might have chosen as an appropriate topic for a nation under siege. Although I normally object to the changing of written material into an easier media, this re-reversal will be well worth it.